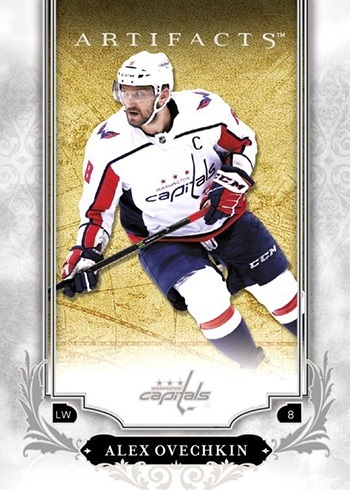 搶先看:2018-19 Upper Deck Artifacts Hockey - 球員卡相關消息區 - 育盛球員卡(球星卡)及各類運動討論區 - Powered by Discuz! 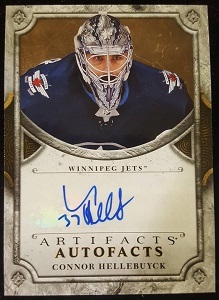 2018-19 Upper Deck Artifacts Hockey offers a pre-season take that’s focused much more on autographs and memorabilia cards than the likes of earlier sets such as MVP and O-Pee-Chee. That’s not to say there isn’t other things happening on the checklist, because there are. Rookie Redemptions return and the Upper Deck Bounty program adds a new challenge. 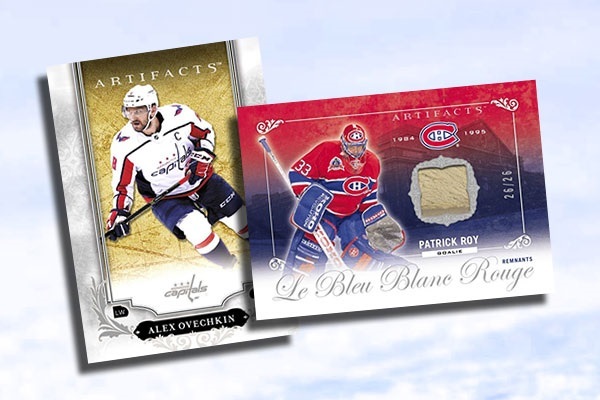 2018-19 Upper Deck Artifacts Hockey hobby boxes are relatively small, but they still come with eight packs. 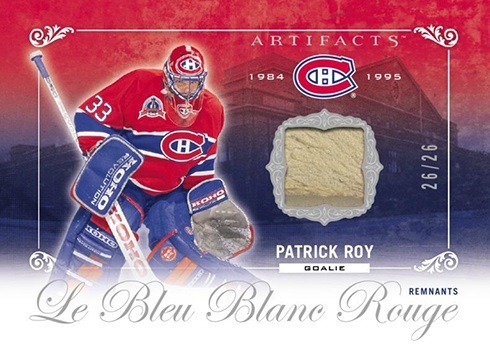 In each are three total autographs, memorabilia cards or Aurum inserts. 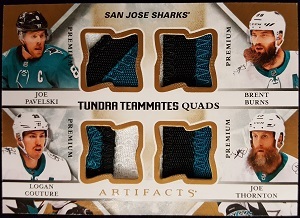 The 2018-19 Upper Deck Artifacts main set has a few sections. It starts with 100 regular cards, which make up the shell set. In addition to that are three subsets of serial-numbered cards: Stars (/699), Legends (/599) and Rookies (/999). 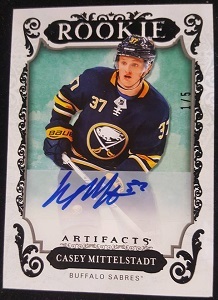 Because Artifacts comes out before the season, live Rookie Cards are players who debuted late in 2017-18. Ryan Donato, Casey Mittelstadt and Adam Gaudette are among them. Basic parallels come in a few different colors. Ruby are the most common with 299 copies for all cards but Rookies, which have 399. Other parallels include Emerald (/99), Aqua (/45), Purple (/20) and Black (/5). 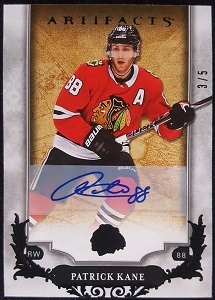 Many base cards also get autograph and memorabilia makeovers. 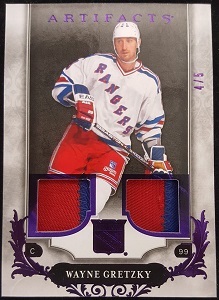 Starting with jersey cards, veterans, Stars and Legends have four levels of cards numbered to 165 and less. 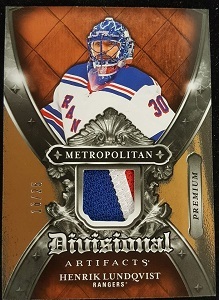 Rarer memorabilia parallels include patches and other premium pieces like tags. There are also autographs and autographed memorabilia versions for Stars and Legends cards that have no more than 45 copies each. 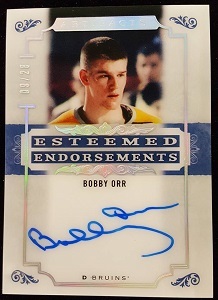 Rookies come with similar levels of signatures and relics, although the more common types are more plentiful. 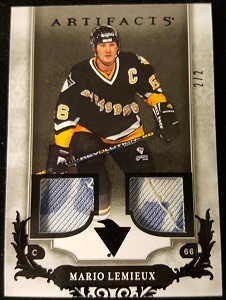 Rookie Materials cards start with print runs and go down from there. Autographs and autographed memorabilia cards have 99 copies or less. 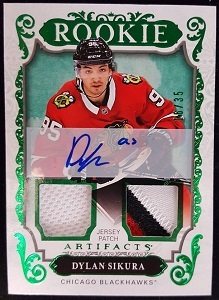 Not all of the signatures and relics in 2018-19 Upper Deck Artifacts Hockey are parallels of the main set. Several standalone inserts are also part of the checklist. Honored Hopefuls return for another round. Separate autograph and memorabilia lineups highlight players with a high likelihood of having punched their ticket for Hall of Fame induction. 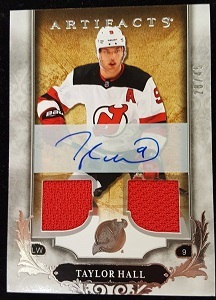 Whether it’s an Honored Hopefuls Autograph or Relic, these are numbered to 27 copies each. Tundra Teammates are also back. These have memorabilia from two (/199) and four (/99). Premium versions have 15 copies for Duals and ten for Quads. 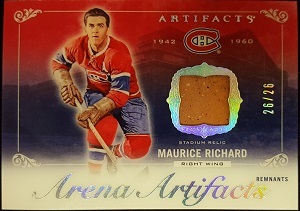 Pieces from the old Montreal Forum are embedded in Le Bleu Blanc Rogue Remnants (/26). 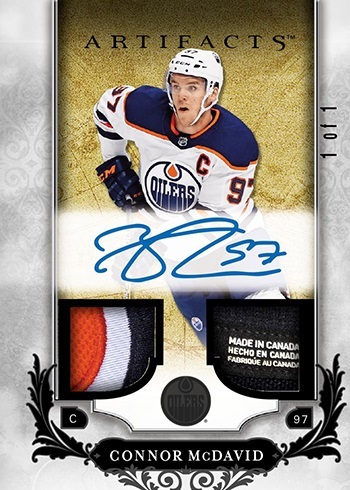 Lord Stanley’s Legacy has a few different versions including jersey (1:160 packs), Relics Premium (/25) and Signatures (1:288). Esteemed Endorsements (/28) is all about retired players. These come with on-card autographs plus inscriptions. 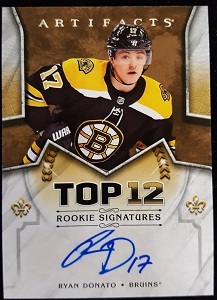 Other autograph inserts in the product include Autofacts (1:48), Top 12 Rookie Signatures (1:1,200), and Top 12 Rookie Signatures 2017-18 Updates (1:1,120). 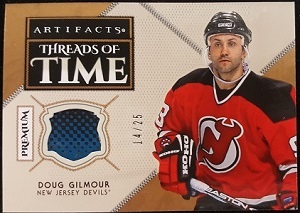 More memorabilia can be found in Threads of Time Jersey (1:300), Threads of Time Premium (/25), Year One Rookies Sweaters Jersey (1:48), Year One Rookies Sweaters Premium (/25), Divisional Artifacts Jersey (1:24) and Divisional Artifacts Premium (/25). 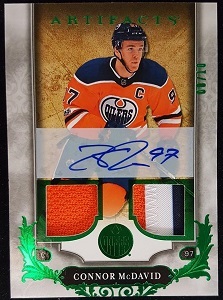 The idea behind all of Upper Deck’s Bounty programs is to reward collectors who undertake a set-building challenge. 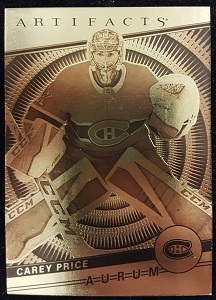 For the 2018-19 Upper Deck Artifacts Bounty, it means completing the full set of 48 Aurum inserts. The most common cards are 1:20 packs. Short prints are All-Stars and Holdover Rookies, which are both 1:640 packs. 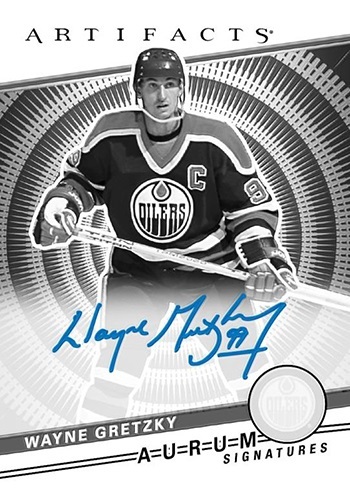 The first 25 people to finish the set get cards #49 and 50 in the set, an exclusive set of nine Aurum White cards and an Aurum White Autograph signed by Wayne Gretzky. 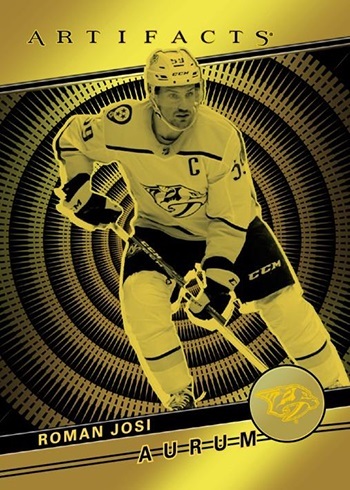 After the first 25 rewards are handed out, remaining collectors who finish the set of 48 get the two Aurum bonus cards. 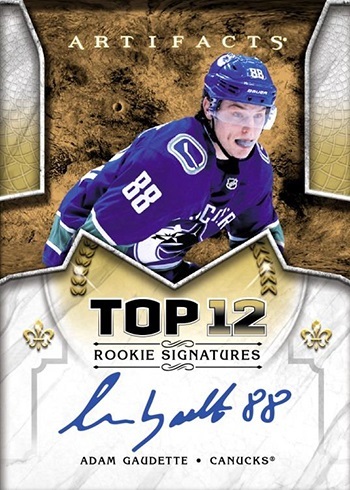 As part of the solution of overcoming not being able to have the new rookie class in the product — at least those debuting that year — Artifacts has a long tradition with including Rookie Redemptions. 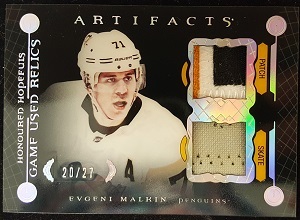 They’re back in 2018-19 Artifacts Hockey at a rate of one per hobby box. A total of 40 different cards, one for each team plus a handful of wild cards, are 1:9 packs. The final versions of these cards will bookend the base set. They also have Emerald parallels that land 1:58 packs. 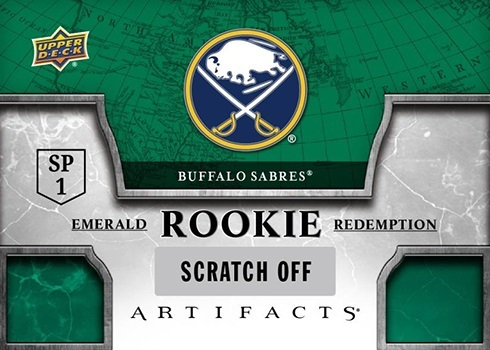 A pair of SP Variation Rookie Redemptions are 1:2,200 packs. These also have Emerald parallels (1:9,216). 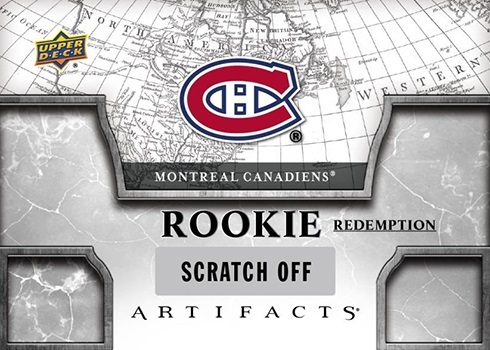 Eighteen Rookie Redemption Autographs, which come with Roman Numerals I through XVIII, are 1:80 packs. 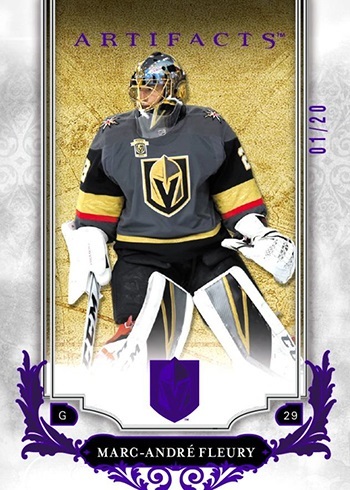 Five players also have Relic versions at the following levels: Silver Dual Jersey (1:115), Silver Dual Jersey Autograph (1:940), Emerald Jersey Patch (1:465), Emerald Jersey Patch Autograph (1:1,843), Purple Spectrum Dual Patch (1:940), Purple Spectrum Dual Patch Autograph (1:4,608), Black Patch Tag (1:9,216), and Black Patch Tag Autographs (1:46,080).